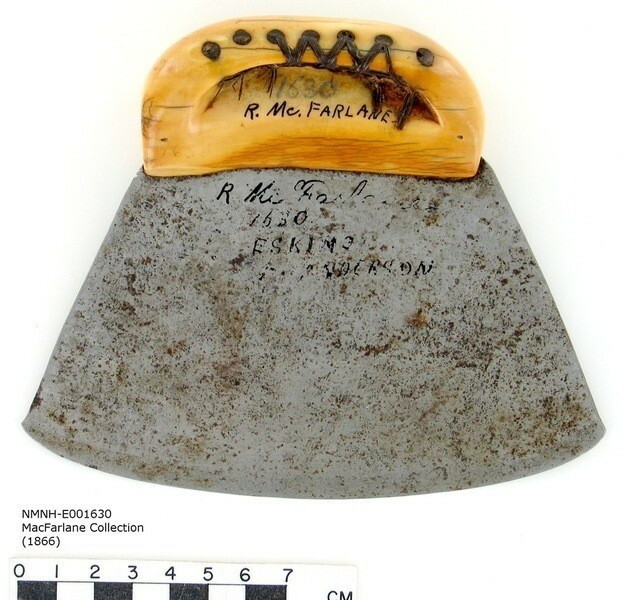 The MacFarlane Collection contains more than 300 cultural artifacts purchased or traded from Inuvialuit during a brief period in the mid-19th century, when the Hudson’s Bay Company’s operated the Fort Anderson trading post on the Anderson River. Roderick MacFarlane was in charge of the post. He began collecting objects from the region after meeting the naturalist Robert Kennicott, a representative for the new Smithsonian Institution that was being built in Washington, D.C., when Kennicott was in the north looking for objects for the Smithsonian. MacFarlane purchased cultural artifacts from local Inuvialuit populations. This ethnographic collection is one of the earliest of its kind from Inuvialuit territory, and shows the vibrant, land-based lifestyle of the local people at that time. The objects are very diverse—a full range of skin clothing, hunting and fishing gear, domestic tools, personal jewelry, a wide range of pipes, tools and artworks, and models of watercraft and sleds that were too large to send south —and show the remarkable skill of the people who made them. In addition to collecting cultural artifacts, MacFarlane was an avid collector of natural history specimens, and organized lengthy expeditions in search of birds, eggs, plants, mammals, and rocks.